Otunba Gani Adams is the National Coordinator of the Oodua Peoples Congress (OPC). He speaks with FREEDOM ONLINE on the protest against the Chairman of the Independent National Electoral Commission (INEC), Prof. Attahiru Jega, and why President Goodluck Jonathan will be reelected on March 28. What prompted the Lagos protest? For the past four months, the INEC Chairman, Prof. Attahiru Jega, has been playing pranks with voter registration. The issue of PVCs, inconsistency about the distribution of PVCs and short changing of the South-West, among others, prompted the protest. A few days to the election, INEC is telling us that about 81 per cent of people have collected their PVCs but in South-West, those with PVCs are not up to 70 per cent. We strongly believe Jega deliberately wants to deny majority of Nigerians their franchise. Probably, he is targeting some selected states from getting PVCs. What also prompted the protest was the illegal creation of 30,000 polling booths by INEC in the North against the South. When this idea came up seven months ago, many organisations criticised the action but Jega is yet to address that. There is also the issue of under age registration in the North. When the allegation was made, the INEC chairman did not issue any categorical statement to denounce it. These three issues gave us a serious concern as Nigerians. That shows clearly that we don’t have confidence in him any more. So, we have come to the conclusion that Jega cannot conduct a credible election in Nigeria. One of the ingredients of democracy and free and fair election is that everybody must be registered and get their PVC to exercise their civic rights. In a situation when a larger majority have been denied their rights, it would cause problem. So, we members of the Coalition are saying he is not capable of conducting the election. He should go on his terminal leave and allow another person to conduct the election. Do you think whoever replaces him will perform better? What gives you the impression that the person will not perform better than Jega? Do you know that two days to the election, INEC chairman can change any state Resident Electoral Commission (REC) and replace him with another person? So, the same can happen to INEC Chairman. Nobody is indispensable. I believe whoever that would take over from Jega would learn from the mistake of his exit. Such a person will not want to fall victim of how his predecessor was removed from office. Former electoral boss, Prof. Humphrey Nwosu, who conducted the 1993 election, started well, but he was influenced by some bad eggs in the system. Recently, you promised President Goodluck Jonathan six million votes. Was the rally a way of showing your strength? The rally was basically for Jega, but at the same time, it was an opportunity to send a message to show that we still support President Goodluck Jonathan to continue his transformation agenda. There is no OPC member who will not vote for President Jonathan. President Goodluck Jonathan has won our hearts because of his promise to implement the national confab reports. Since 2010, his administration has been peaceful unlike when our kinsman was at the helm of affairs. President Jonathan is peace loving, no provocation from his government against any ethnic nationality and he never targetted us as a group to destroy. That gave us confidence that this is the type of government we desire in Nigeria. It is generally believed you are backing Jonathan because of the pipeline contract recently awarded to you. No, the issue of the pipeline contract has been on for about two years now. You will realise that some groups in the South-South have been doing the job for the past five years. It was Dr Fasehun who raised the issue then. The contract the NNPC has just given us is to test run and guard pipelines for three months after which they would now confirm us. We were also given some guidelines to follow on the amount they pay their personnel. When the issue of the pipeline became public, spokesperson for the All Progressives Congress, Alhaji Lai Mohammed, was running from pillar to post on the contract, castigating us and the presidency. If care is not taken, I will fight him spiritually and morally. I’m not going to send anybody to do the work for me. I will do it myself. I’m not Fasehun he thinks he can rubbish. Where was Lai Mohammed before Tinubu made him Chief of Staff in Lagos? If all these APC people in South-West are truly Yoruba sons, they would have withdrawn from their master, Tinubu, after watching the documentary on AIT. The Yoruba are people of integrity. I don’t know why some of them are still with Tinubu, probably he has put them on oath. The opposition, led by Tinubu, will always insult President Jonathan and he will simply smile. You always see calmness in him. The way and manner Nigerians and opposition people are abusing the president, if it were when Bola Tinubu was governor of Lagos State and he was abused like that, that person would have been a dead person. Jega, Tinubu and APC can’t stop Yoruba from voting for Jonathan. Look at the documentary been aired on AIT. Full of facts and figure. Now, he has hired lawyers to seek injunction and stop airing of the documentary. He should have approached the court to denounce the facts in the documentary. Why is he running from pillar to post if he is not guilty of the crime? I am using this opportunity to call on the judiciary to stop protecting corrupt individuals in the society. interest of the Yoruba with the rally. I heard about them but I can’t reply to such a parasite group. I’m beyond that level. Tinubu can give anybody money to react. They are a faceless group. Forget them, my brother. I want them to come out, show their faces and tell me I am not in control of OPC. During the rally, why were some OPC members armed with guns and dangerous weapons? 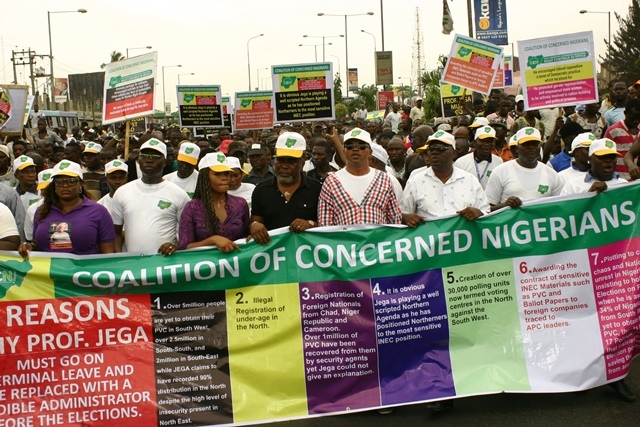 The picture shown by Channels Television was an old picture taken during the rally organised by the Baba Fasehun faction of OPC during the anti-Boko Haram rally on the same Ikorodu road in September, 2011. Thank God you were at the rally. Did you see anybody with arms or dangerous ammunition? This is just propaganda from Tinubu and the APC to discredit us. I see Channels TV as a station with integrity. They should not allow APC destroy the image they have built for years. How do we check violence during the election? My advice to my members is that they should be peaceful and law abiding because I was impressed with what I saw at the rally on Monday with their turn out in large number. Also, there were about 25 Nollywood actors and actresses in the protest. The rally was not actually an OPC affair alone. But we had the largest population.